Here’s a shopify slack gif app that stands out from the rest! Every e-commerce entrepreneur remembers the feeling of accomplishment they had after their first sale. While there are plenty of tools out there to help streamline e-commerce processes, that’s not the only thing that’s important. Staying motivated by having fun can be helpful too. As a digital marketing company we actually have our own shopify store that gets more and more sales every month! We like to drink our own link juice here at Logic Inbound and use this app in on our own internal store. The Shopify app “Make it Rain” is about recapturing the simple joy of each success. It’s currently only integrated with the popular team communication service Slack. 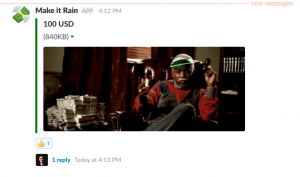 When you install Make it Rain, your Slack channel will receive live updates whenever a new order is paid. These messages will include the specific dollar amount paid and a fun GIF involving raining dollar bills. It’s completely free, so you won’t have to pay a dime from that fresh sale either. While the Make it Rain app has the practical function of letting you know when you’ve been paid for a sale right away, it’s really about having a good time and keeping you and your team motivated. Go pick it up on the Shopify app store.